The Server Core container image has been further optimized for lift-and-shift scenarios where you can migrate existing code bases or applications into containers with minimal changes, and it’s also 60% smaller. The Nano Server container image is nearly 80% smaller. In the Windows Server Semi-Annual Channel, Nano Server as a container base OS image is decreased from 390 MB to 80 MB. For more information, see Changes to Nano Server in the next release of Windows Server and Windows Server, version 1709 for developers. Check out Project Honolulu for a simplified, integrated, secure experience to help IT administrators manage core troubleshooting, configuration, and maintenance scenarios. Project Honolulu includes next generation tooling with a simplified, integrated, secure, and extensible interface. Project Honolulu includes an intuitive all-new management experience for managing PCs, Windows servers, Failover Clusters, as well as hyper-converged infrastructure based on Storage Spaces Direct, reducing operational costs. Nano Container and Server Core Container: First and foremost, this release is about driving application innovation. Nano Server, or Nano as Host is deprecated and replaced by Nano Container, which is Nano running as a container image. For more information about containers, see Container Networking Overview. Server Core as a container (and infrastructure) host, provides better flexibility, density and performance for existing applications under a modernization process and brands new apps developed already using the cloud model. VM Load Balancing is also improved with OS and Application awareness, ensuring optimal load balancing and application performance. Storage-class memory support for VMs enables NTFS-formatted direct access volumes to be created on non-volatile DIMMs and exposed to Hyper-V VMs. This enables Hyper-V VMs to leverage the low-latency performance benefits of storage-class memory devices. Storage-class memory support for VMs enables NTFS-formatted direct access volumes to be created on non-volatile DIMMs and exposed to Hyper-V VMs. This enables Hyper-V VMs to leverage the low-latency performance benefits of storage-class memory devices. Virtualized Persistent Memory (vPMEM) is enabled by creating a VHD file (.vhdpmem) on a direct access volume on a host, adding a vPMEM Controller to a VM, and adding the created device (.vhdpmem) to a VM. Using vhdpmem files on direct access volumes on a host to back vPMEM enables allocation flexibility and leverages a familiar management model for adding disks to VMs. Virtualized Persistent Memory (vPMEM) is enabled by creating a VHD file (.vhdpmem) on a direct access volume on a host, adding a vPMEM Controller to a VM, and adding the created device (.vhdpmem) to a VM. Using vhdpmem files on direct access volumes on a host to back vPMEM enables allocation flexibility and leverages a familiar management model for adding disks to VMs. Container storage – persistent data volumes on cluster shared volumes (CSV). In Windows Server, version 1709 as well as Windows Server 2016 with the latest updates, we’ve added support for containers to access persistent data volumes located on CSVs, including CSVs on Storage Spaces Direct. This gives the application container persistent access to the volume no matter which cluster node the container instance is running on. For more info, see Container Storage Support with Cluster Shared Volumes (CSV), Storage Spaces Direct (S2D), SMB Global Mapping. Container storage – persistent data volumes with SMB global mapping. In Windows Server, version 1709 we’ve added support for mapping an SMB file share to a drive letter inside a container – this is called SMB global mapping. This mapped drive is then accessible to all users on the local server so that container I/O on the data volume can go through the mounted drive to the underlying file share. For more info, see Container Storage Support with Cluster Shared Volumes (CSV), Storage Spaces Direct (S2D), SMB Global Mapping. Windows security baselines have been updated for Windows Server and Windows 10. A security baseline is a group of Microsoft-recommended configuration settings and explains their security impact. For more information, and to download the Policy Analyzer tool, see Microsoft Security Compliance Toolkit 1.0. Network encryption enables you to quickly encrypt network segments on software-defined networking infrastructure to meet security and compliance needs. Host Guardian Service (HGS) as a shielded VM is enabled. Prior to this release, the recommendation was to deploy a 3-node physical cluster. While this ensures the HGS environment is not compromised by an administrator, it was often cost prohibitive. Linux as a shielded VM is now supported. For more information, see Guarded fabric and shielded VMs overview. Test failover: the option to mount the destination storage is now possible through the test failover feature. You can mount a snapshot of the replicated storage on destination nodes temporarily for testing or backup purposes. For more information, see Frequently Asked Questions about Storage Replica. Project Honolulu support: Support for graphical management of server to server replication is now available in Project Honolulu. This removes the requirement to use PowerShell to manage a common disaster protection workload. SMB1 and guest authentication removal: Windows Server, version 1709 no longer installs the SMB1 client and server by default. Additionally, the ability to authenticate as a guest in SMB2 and later is off by default. For more information, review SMBv1 is not installed by default in Windows 10, version 1709 and Windows Server, version 1709. 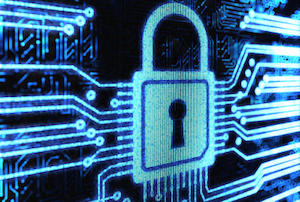 SMB2/SMB3 security and compatibility: Additional options for security and application compatibility were added, including the ability to disable oplocks in SMB2 for legacy applications, as well as require signing or encryption on per-connection basis from a client. For more information, review the SMBShare PowerShell module help. Data Deduplication now supports ReFS: You no longer must choose between the advantages of a modern file system with ReFS and the Data Deduplication: now, you can enable Data Deduplication wherever you can enable ReFS. Increase storage efficiency by upwards of 95% with ReFS. DataPort API for optimized ingress/egress to deduplicated volumes: Developers can now take advantage of the knowledge Data Deduplication has about how to store data efficiently to move data between volumes, servers, and clusters efficiently. RDS is integrated with Azure AD, so customers can leverage Conditional Access policies, Multifactor Authentication, Integrated authentication with other SaaS Apps using Azure AD, and many more. 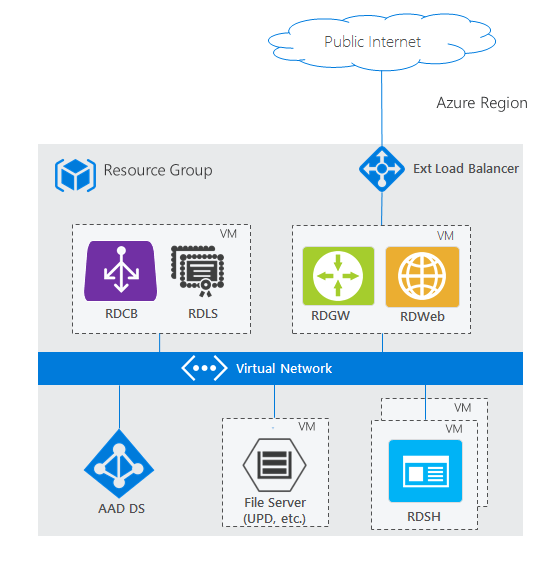 For more information, see Integrate Azure AD Domain Services with your RDS deployment. Docker’s Routing Mesh is supported. Ingress routing mesh is part of swarm mode, Docker’s built-in orchestration solution for containers. For more information, see Docker’s routing mesh available with Windows Server version 1709. New features for Docker are available. 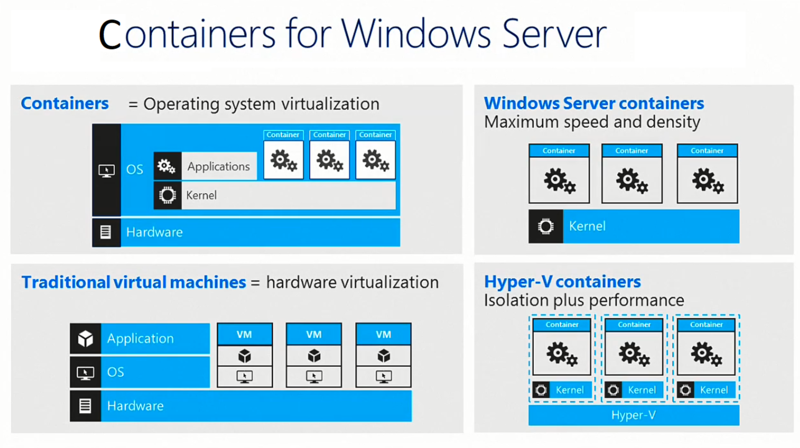 For more information, see Exciting new things for Docker with Windows Server 1709. Windows Networking at Parity with Linux for Kubernetes: Windows is now on par with Linux in terms of networking. 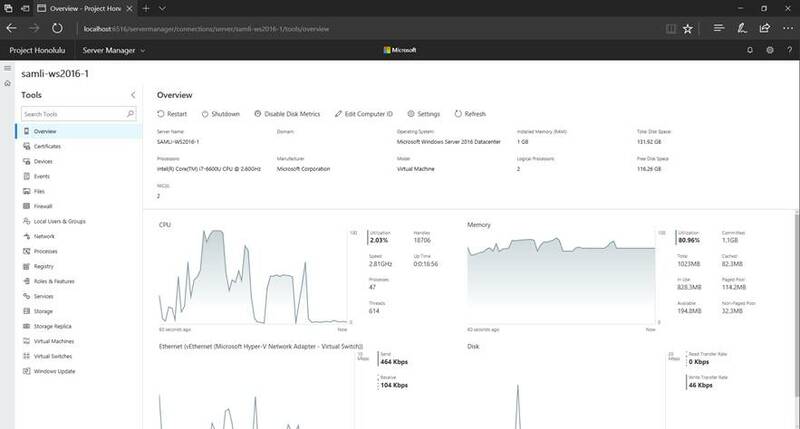 Customers can deploy mixed-OS, Kubernetes clusters in any environment including Azure, on-premises, and on 3rd-party cloud stacks with the same network primitives and topologies supported on Linux without the need for any workarounds or switch extensions. Core network stack: Several features of the core network stack are improved. For more information about these features, see Core Network Stack Features in the Creators Update for Windows 10. TCP Fast Open (TFO): Support for TFO has been added to optimize the TCP 3-way handshake process. TFO establishes a secure TFO cookie in the first connection using a standard 3-way handshake. Subsequent connections to the same server use the TFO cookie instead of a 3-way handshake to connect with zero round trip time. CUBIC: Experimental Windows native implementation of CUBIC, a TCP congestion control algorithm is available. The following commands enable or disable CUBIC, respectively. Receive Window Autotuning: TCP autotuning logic computes the “receive window” parameter of a TCP connection. High speed and/or long delay connections need this algorithm to achieve good performance characteristics. In this release, the algorithm is modified to use a step function to converge on the maximum receive window value for a given connection. TCP stats API: A new API is introduced called SIO_TCP_INFO. SIO_TCP_INFO allows developers to query rich information on individual TCP connections using a socket option. IPv6: There are multiple improvements in IPv6 in this release. ISATAP and 6to4: As a step towards future deprecation, the Creators Update will have these technologies disabled by default. Dead Gateway Detection (DGD): The DGD algorithm automatically transitions connections over to another gateway when the current gateway is unreachable. In this release, the algorithm is improved to periodically re-probe the network environment. Test-NetConnection is a built-in cmdlet in Windows PowerShell that performs a variety of network diagnostics. In this release we have enhanced the cmdlet to provide detailed information about both route selection as well as source address selection. Virtual Network Encryption is a new feature that provides the ability for the virtual network traffic to be encrypted between Virtual Machines that communicate with each other within subnets that are marked as “Encryption Enabled”. This feature utilizes Datagram Transport Layer Security (DTLS) on the virtual subnet to encrypt the packets. DTLS provides protection against eavesdropping, tampering and forgery by anyone with access to the physical network. Pre-Logon Infrastructure Tunnels. By default, Windows 10 VPN does not automatically create Infrastructure Tunnels when users are not logged on to their computer or device. You can configure Windows 10 VPN to automatically create Pre-Logon Infrastructure Tunnels by using the Device Tunnel (prelogon) feature in the VPN profile. Management of Remote Computers and Devices. You can manage Windows 10 VPN clients by configuring the Device Tunnel (prelogon) feature in the VPN profile. In addition, you must configure the VPN connection to dynamically register the IP addresses that are assigned to the VPN interface with internal DNS services. Specify Pre-Logon Gateways. You can specify Pre-Logon Gateways with the Device Tunnel (prelogon) feature in the VPN profile, combined with traffic filters to control which management systems on the corporate network are accessible via the device tunnel. Categories: Azure, Azure Stack, Containers, Docker, Hyper-V, Linux, Microsoft Azure, NanoServer, Uncategorized, Windows 10, Windows Containers, Windows Server 2016, WindowsAzure | Tags: 1709, Containers, Docker, HyperV, Microsoft, NanoServer, winserv | Permalink.